First of all, I realize that Jesus could have came back and got His church, had the Marriage Supper of the Lamb and got the elders in place by the time I got to part Five. Forgive me, brothers and sisters. I have been busy and have have had the usual stuff to tend to on this blog. As always, onward Christian soldiers. 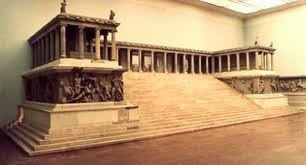 Pergamos, or Pergamum was an important political and religious center in what is now Turkey. The large and grotesque altar is also known as the throne of Zeus (the egomaniacial god with the thunderbolts). If you read the descriptions of Zeus, he is a dead ringer for Satan. This altar is also known as Satan's throne. No wonder this is where many Christians met their demise, including Antipas whom Jesus named. the Nicolaitanes, whose name suggests a leadership over the laity. This group also believed it was fine to sin as long as you confessed your 'sins' to a member of the clergy. The problem Christ had with these clowns is because they strove to glorify man and not Him. This same group also practiced Baylonian religion that was a huge stumbling block for Israel. The message of "Hidden Manna" is also the title of one of my dear friends, Tracie Justice and this is for good reason. Christ promised this church a fresh start and being well taken care of if they would only repent. Manna is what the Israelites ate in the wilderness for 40 years and sustained them through some tough times. Christ is compassionate and the only One who can forgive sin. He will sustain you if trust in Him. Blessings.